The AFA Podcast returns once again! This time around Chris, Rachael and Jill are here to discuss the usual range of animation topics.. and review the French Steampunk romp April and The Extraordinary World. First we talk news (0:04- 0:25) including some exciting animation exhibitions around the world, the return of Steven Universe and the StarFox animated short! Then it's on to catch up with what we've been watching, (0:26- 0:51) including Star Wars Rebels, Phoenix Wright and Yuri Kuma Arashi. 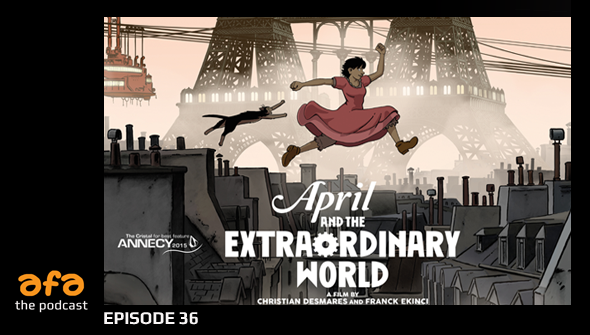 Then finally it's on to our main topic for the week, with the wonderful French animated steam-punk adventure April and The Extraordinary World (0:52-1:40) .All Time codes are Approximate. Contains spoilers for Star Wars Rebels Season 2 and April and The Extraordinary World.